PacketExpert™ 1G Software Ver 9.2.8 | Download Now! PacketExpert™ 10G Software Ver 9.1.31 | Download Now! 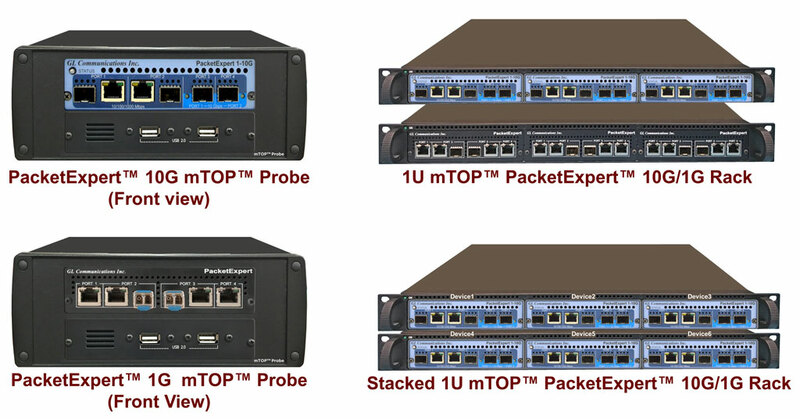 GL offers high density variant using mTOP™ 1U/2U rack mount enclosures within which PacketExpert™ 10GX USB units are stacked to provide high density GigE ports form factor solution for testing GigE switches, routers and network conditions. The sleek design of PacketExpert™ 10GX (PXN100) portable hardware allows multiple units to be easily placed in a mTOP™ 1U/2U rack mount enclosure (MT001, MT002, MT003, MT004) to provide high density GigE ports form factor solution (MT001 + PXN100). Each hardware unit in the rack system is capable of both 1 Gbps and 10Gbps testing. It has two 10/1 Gbps Optical ports, and two 1 Gbps Electrical/Optical ports. The 10 Gbps Optical ports can be down-shifted to 1Gbps, thus allowing all 4 ports for 1 Gbps testing. It is a compact with reduced power requirements appliance for high performance and optionally can include 12-port user-configurable TTL trigger ports as an important enhancement. A single PacketExpert™ mTOP™ test solution (MT001 + PXN100) with stacked rack units greatly reduces the licensing costs per device. It is a perfect ethernet test tool for customers who require multi-port testing but are constrained by lab space. For more details on mTOP™ rack-based platform, refer to Test Tools in Rack Based Platforms. PacketExpert SA (PXN112) is a 12-Port PacketExpert™ w/ Embedded Single Board Computer (SBC). SBC Specs: Intel Core i3, Win10 Pro 64-bit OS, USB 3.0 Hub, 240 GB Hard drive, 8G Memory. 19" 1U Rackmount enclosure includes 12-Port PacketExpert™ 10GX w/ MT001 and 3x PXN100 units. PacketExpert SA (PXN124) is a 24-Port PacketExpert™ w/ Embedded Single Board Computer (SBC). SBC Specs: Intel Core i3, Win10 Pro 64-bit OS, USB 3.0 Hub, 240 GB Hard drive, 8G Memory. 19" 2U Rackmount enclosure includes 24-Port PacketExpert™ 10GX w/ MT001, MT002 and 6x PXN100 units. HD-PacketExpert™ provides the important functionalities such as Wire speed BERT, RFC 2544 Testing, Smart Loopback, ExpertSAM, Record and Playback, PacketBroker, WAN Link Emulation, Multi Stream Traffic Generator and Analyzer, and ExpertTCP. Wire-speed BERT, Selective-Port and Smart Loopback, RFC 2544, ExpertSAM, Record and Playback, PacketBroker, Multi Stream Traffic Generator and Analyzer, ExpertTCP, and WAN Link Emulation. User selectable Electrical and/or Optical interface for 4x 1G ports and optical only 2x 10G ports allowing mixed technology testing. Rack mountable, high density, multi-device support. Stack multiple rack units to handle large number of ports. Command line Interface (CLI)to access all the functionalities remotely such as using TCL, Python, C# and MAPS™ CLI Client/Server architecture. Real-time results are presented per port and all-port basis in both tabular as well as graphical formats. 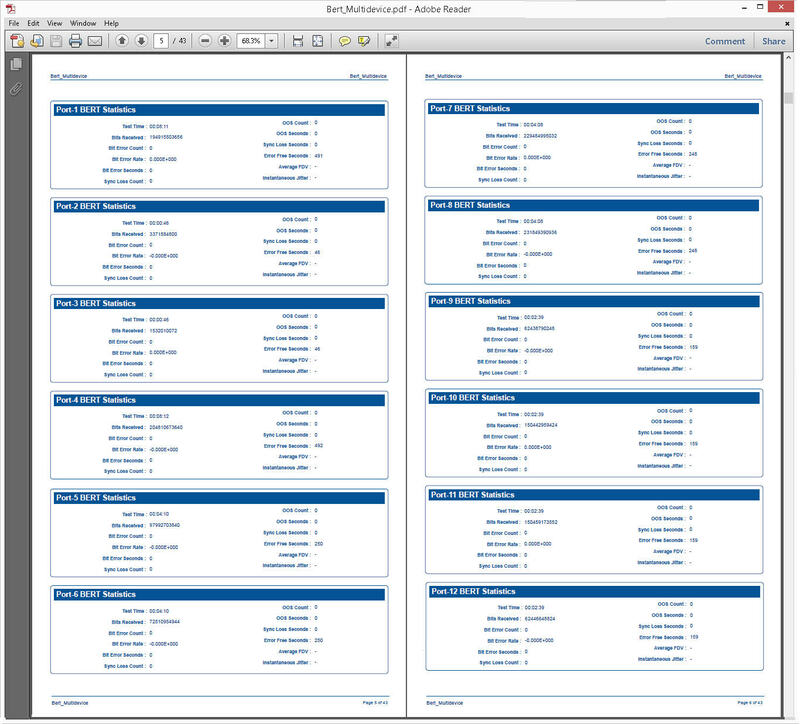 Consolidated detailed test result reports for all the ports on all the devices in PDF and CSV file formats. PacketExpert™ SA (PXN112) is a 12-Port PacketExpert™ w/ Embedded Single Board Computer (SBC). SBC Specs: Intel Core i3, Win10 Pro 64-bit OS, USB 3.0 Hub, 240GB Hard drive, 8G Memory. 19" 1U Rackmount enclosure includes 12-Port PacketExpert™ 10GX w/ MT001 and 3x PXN100 units. PacketExpert™ SA (PXN124) is a 24-Port PacketExpert™ w/ Embedded Single Board Computer (SBC). SBC Specs: Intel Core i3, Win10 Pro 64-bit OS, USB 3.0 Hub, 240GB Hard drive, 8G Memory. 19" 2U Rackmount enclosure includes 24-Port PacketExpert™ 10GX w/ MT001, MT002 and 6x PXN100 units. HD-PacketExpert™ includes report generation option to generate consolidated CSV and PDF file format reports for all the 12/24 ports. The following sample CSV and PDF reports generated for ‘All ports BERT’ test includes Interface, BERT Statistics, Tx/Rx Statistics, Tx Configuration, and Rx Configuration details for each of the 12 /24 ports. Please Note: The 'Pxx' in the Item No. refers to the hardware platform on which the software will be running. Therefore, 'Pxx' can either be PXE (1G) or PXG (10G) or PXN (10GX) depending upon the hardware.